“but not turkey” she responded. 1 tbsp olive oil, 1 onion, peeled and chopped, 1 red pepper, deseeded and diced, 1 tbsp plain white flour, about 150m chicken stock, 300g diced turkey meat, 100g cooked long grain rice, 2 tbsp single cream or you could use fromage frais or creme fraiche, salt and freshly ground black pepper, a couple of tbsp fresh herbs including chopped tarragon, parsley or even dill, 300g block of puff pastry, and a little beaten egg to glaze. You could use or add other things too like mushrooms, wild rice, green peppers, different herbs. First preheat the oven to 220 degree C/425 F.Gas mark 7. Heat the oil in a pan and sweat he onion and pepper for a few minutes without browning. Sprinkle in the flour and cook for two minutes then remove the pan from the heat. Gradually stir in the stock, then return to the heat and cook until thickened. Remove from the heat and stir in the diced turkey, cooked rice, cream or fromage frais, seasoning to taste and herbs. Cover and leave until cool. Roll the pastry out on a lightly floured surface to make a 30 x 15cm / 12×6 inch oblong. Place the cooled filling on one side of the pastry oblong and brush edges lightly with a little beaten egg. Fold the pastry over encasing the filling, then seal the edges firmly pressing them together with the back of a knife. Transfer to a baking sheet and allow to relax in the fridge for 15 to 30 minutes. Make a couple of slashes in the top of the pastry and brush with beaten egg. Cook in the oven for 30 minutes or until well risen and golden brown. 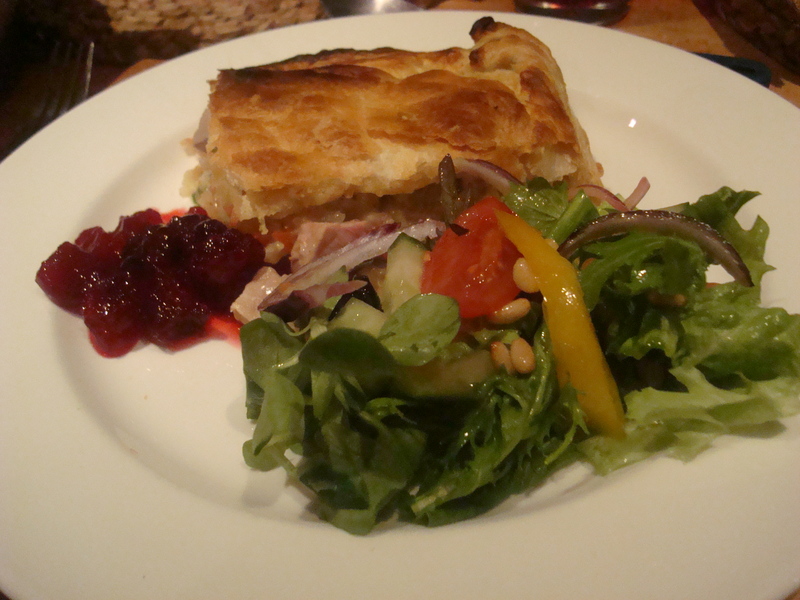 This made such a lovely change from all the Christmas food, served simply with a salad and some home-made cranberry relish. Although i have to say it was still sufficiently comforting on yet another snowy day.